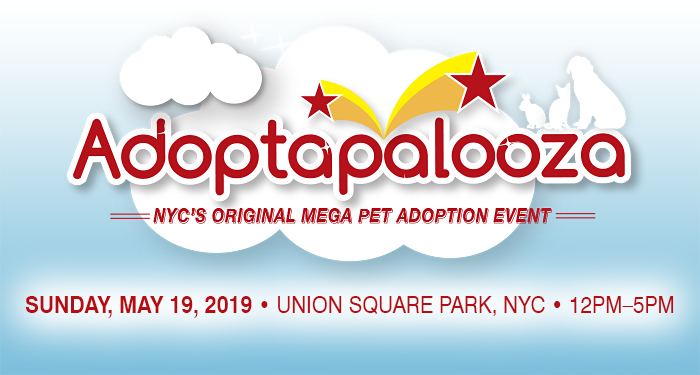 First presented by the Mayor's Alliance for NYC's Animals in 2010, Adoptapalooza will make its 2019 debut under the new leadership of Rock & Rawhide. 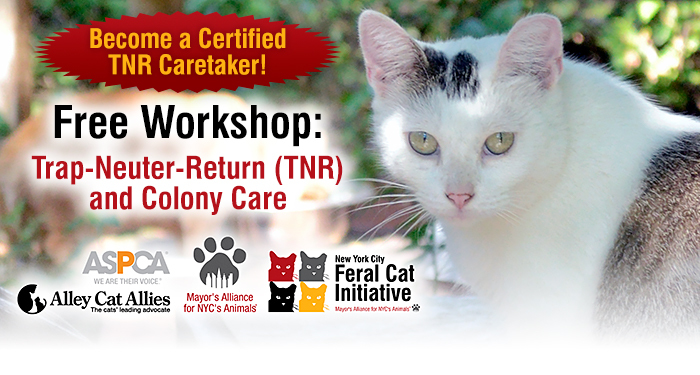 Become a Certified TNR Caretaker! Learn how to care for the feral and stray community cats in your area, and reduce the number of kittens being born on the streets. Attendees become eligible for free and low-cost services and support. With the theme, "Masquerade Ball for Animal Rescue," the 2019 New York Pet Fashion Show featured dogs (and other animals) on the catwalk in four costume runway shows. It's the most wonderful time of the year, but sadly, Bella — a sweet, wheelchair-toting, 10-year-old Pug — found herself without a place to call home this week. Wheels of Hope to the rescue! The NYC Feral Cat Initiative helped countless community cats by educating and supporting Certified TNR Caretakers, collaborating with government and private organizations and individuals, and spreading the word about Trap-Neuter-Return (TNR) via the media and events. Support from donors like you made it possible to save 89% of New York City's homeless pets in 2016 — the same support that has saved the lives of more than 320,000 animals since we began. The collective Live Release Rate among all Alliance community partners, including ACC, increased from 87% in 2014 to an unprecedented 90% in 2015. You can help homeless dogs and cats find permanent, loving homes by supporting the programs that aid 150+ rescue groups and shelters in our city. Volunteers are a critical part of our success, and essential to achieving our collective goal of saving the lives of homeless animals in New York City. 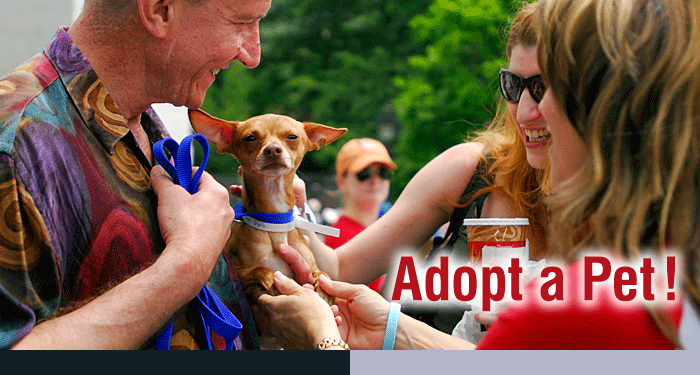 Adopt a Little New Yorker Today! Your new best friend is waiting for you right now at an Alliance Participating Organization (APO) or at an adoption event in New York City. Spaying or neutering your pet reduces euthanasia by preventing unwanted litters, and improves the health and behavior of your cat or dog. Having your pets microchipped is one of the best ways to increase the chance that, if your pet becomes lost or stolen and winds up at an animal shelter or veterinary office, he or she can be returned to you. Licensing contributes to animal control and the protection of the public health. The law requires that all owned dogs be licensed with the dog license tag attached to his/her collar while in public. Dog owners may be fined for violation of these laws. New York City has several programs in place to help struggling pet owners continue to provide their furry family members with veterinary care, food, and other necessities when finances are tight. 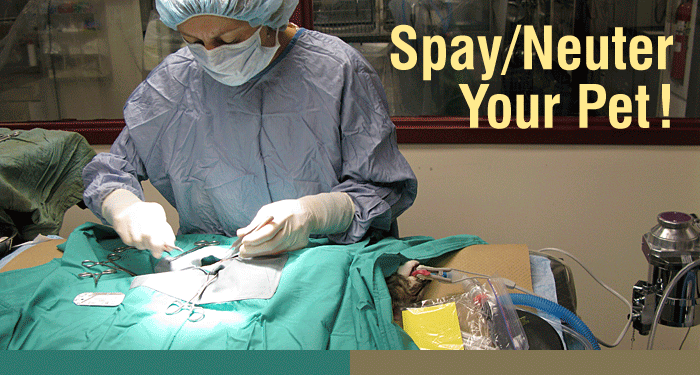 Become a Certified TNR Caretaker! 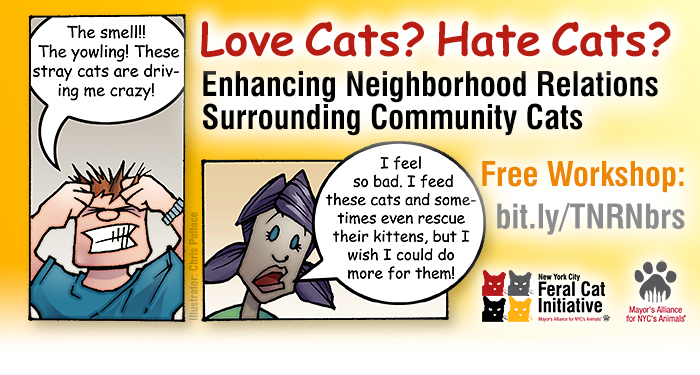 Learn how to care for the feral and stray cats in your community and become eligible for free and low-cost services and support. Designate the Mayor's Alliance for NYC's Animals as your AmazonSmile charity, and Amazon will automatically donate 0.5% of your purchases to help save the lives of NYC's homeless pets when you shop at smile.amazon.com. Your Online Shopping Can Save NYC's Pets! Shop with iGive.com and your everyday purchases from more than 1,700 online stores will benefit NYC's homeless pets at no additional cost to you! A program of the Mayor's Alliance for NYC's Animals, the NYC Feral Cat Initiative is committed to solving New York City's feral cat overpopulation crisis through the humane, non-lethal method of Trap-Neuter-Return (TNR). Wheels of Hope, the Mayor's Alliance for NYC's Animals transport van program, carries animals from from Animal Care Centers of NYC (ACC) shelters to other shelters and rescue groups for adoption. Making NYC a more humane community since 2003! Since 2003, the Mayor's Alliance for NYC's Animals has remained committed to transforming New York City into a community where no dogs or cats of reasonable health and temperament will be killed merely because they do not have homes.